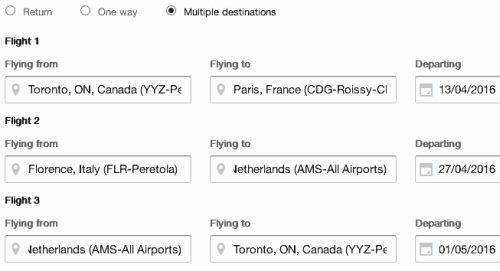 Air France and KLM continue with their very significant price drops from Toronto to Europe for spring 2016 travel. These price drops are making for some *very* interesting multi-city prices, where you can fly to multiple cities within Europe and still keep the price very low, in the range of $489 to $677 CAD (including taxes) for all 3 flights. These prices are also some of the best to Europe for 2016 travel from anywhere in North America. Even the Americans are jealous of these prices right now. The price should come up in the $600s CAD (or less) for all 3 flights. You'll notice that this multi-city flight does still leave you needing to get from Paris to Barcelona, Florence (aka Tuscany), or Zagreb. Paris to Barcelona will generally be the cheapest, at around $60 to $100 CAD, usually on RyanAir or Transavia. Note that they generally use Paris's ORY or BVA airports, which are not the same as the main international one you fly into (CDG). Paris to Florence would be a little more, at around $130-$150 CAD. Although you may also want to look at flying from Paris to Rome (generally quite cheap, at $60 to $80 on RyanAir or EasyJet) and then taking the train from Rome to Florence - a popular route that should only cost around $60. You can also try substituting other cities in Europe for Barcelona, Florence, or Zagreb. For many of them, the price result comes up in the $700s and $800s. Barcelona, Florence, and Zagreb are the only ones I've seen that result in a total price in the $600s or less. toronto, yyz, flight deals, europe, western europe, southern europe, central europe, italy, paris, france, cdg, barcelona, spain, bcn, balkans, southeastern europe, zagreb, croatia, zag, klm, air france, florence, flr and tuscany. 7 Responses to "Toronto to Paris, and then Barcelona (or Italy, or Croatia) to Amsterdam, and then Amsterdam to Toronto - $489 to $677 for all 3 flights"
Thanks for the good deal. I tried to see if it was available at the end of December. It worked for a minute and then it blacked out and I can no longer see the previous cost (about 560$), it's now at over 800$. 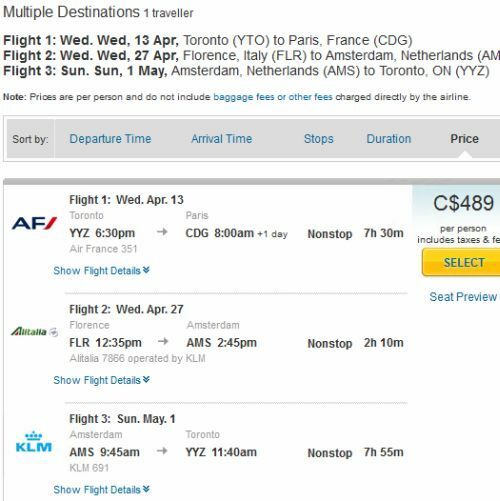 Just booked all non stop flights from Montreal to Paris, Barcelona to Amsterdam then Amsterdam to Montreal from April 16-28 for $669 pp! Amazing! Thanks!